The most recently complete scratch build project is a trestle/bridge/trestle combination. This assembly is built on a 5' radius curve. The structure is made entirely of redwood. The bridge, as well as the one behind it, are loose representations of a Howe Truss. This structure, especially made of wood, would be unusual on a 1950's vintage railroad as the Howe Truss fell out of favor to newer designs before 1870. However, I like the truss rods and the structures were easy to build, so they got transported forward in time about 100 years. 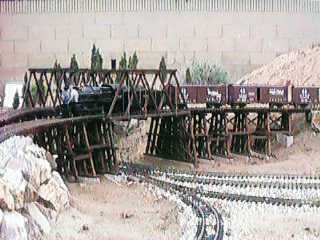 You can find plans to build a bridge like these in my page titled How to Build a Cheap and Dirty Truss Bridge.